One year ago, our youth put together a "Date Night" for the couples in our church on Valentine's Day. 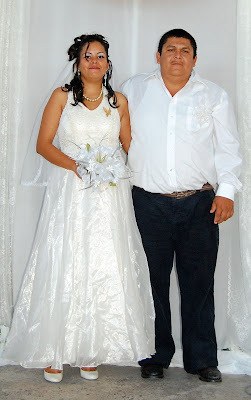 There were 25 couples in attendance and when we finished, some of them were saying, "We should do a wedding next year!" Well, here it is! 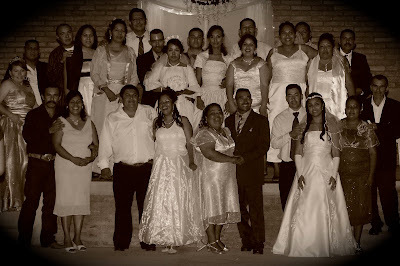 Thirteen couples officially "tied the knot" on Valentine's Day this year in the presence of God and these witnesses. 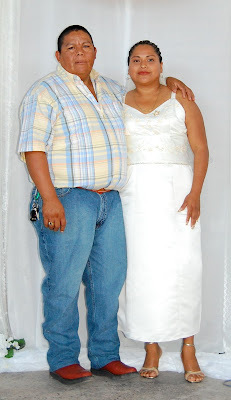 Some of them have been together for over 15 years and one couple has a grandchild. Most of them had already been married in a "civil" wedding with the Judge at the county seat. The five couples that had not been married by the state went to do so in preparation for the "religious" wedding. The civil wedding is basically signing papers to be legally married. The religious wedding is most usually where everything is decked out...the dress, the ceremony, the rings, the wedding party, the reception, etc. This was so exciting! For the past two months we've been planning the details under Geña's leadership along with the assistance of Kathy Elias and everything went really smooth. As the hour approached, the excitement began to build as the couples arrived with their families and Padrinos (what would be known in our culture as Groomsmen and Bridesmaids). The 37 tables set up in the church sanctuary began to fill and the many photographers began to take pictures of the Brides and Grooms up front. 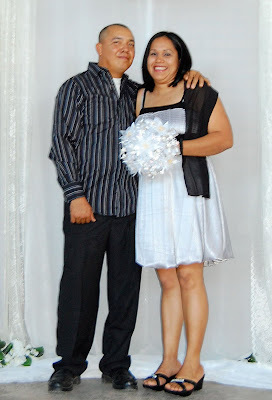 Finally, Geña invited everyone to find their seats as the couples were lining up for the "Grand Entrance." As Jonathan Elias played the wedding march on his saxophone, the couples began to walk down the isle...one by one. Some people were standing and clapping, some were whistling while others shouted, but everyone was captured in the moment. It was unforgettable to see people you've known for such a long time be in the spotlight, each one was important as they walked proud, hand in hand. Once everyone was seated (on the platform and at the tables), Pastor Gollo welcomed everyone and shared a quick introduction of God's plan for marriage. Seven couples on stage right being seated. Six couples on stage left being seated. 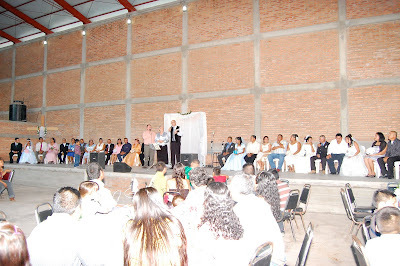 Doug and Jan then presented a message to the couples whom most have had the privilege of being under their counsel and in attendance at the marriage seminar's they have held in Cofradía. What a blessing for them to see "fruit of their labor." Then...the most nervwracking moment...s for the couples. 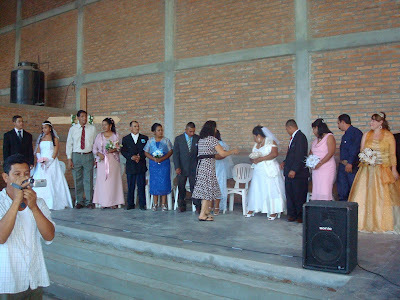 As Pastor Gollo returned to the platform, he called each couple to center stage one by one to make a promise to each other "Si acepto" (I will), exchange vows to one another, give and receive rings, and put on a lasso as a symbol of their union with each other and God (a chord of three strands is uneasily broken). Each couple had Ring Padrinos who bought rings for them and gave to them on the platform as they reached that part of the ceremony (some couples' Padrinos could not make it). 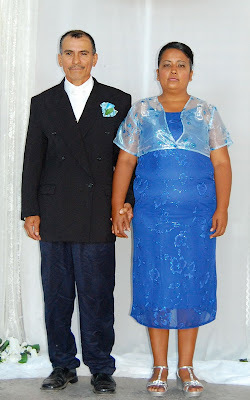 Also, each couple had Lasso Padrinos who bought and put the lasso on them as Pastor Gollo shared the symbolism. 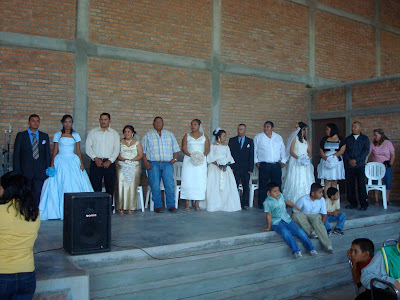 When each couple had finished their 6 minute ceremony, Pastor Gollo announced them "Marido y Mujer" (Husband and Woman). Sounds strange to Americans, but think about what we say, "Man and Wife." Angel and Josefina Martínez from Cofradía. 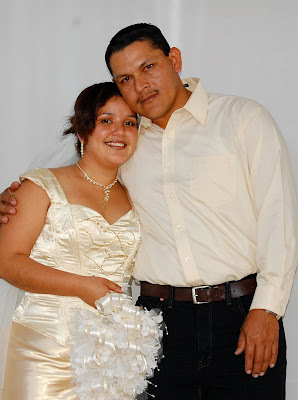 Javier and Fabiola Tapia from Arrayanes. Javier recently received Christ. 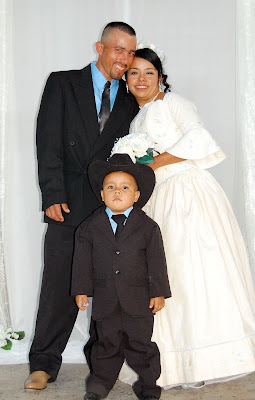 Gabriel and Erika Bábara from Arrayanes. Diego and Carmen González from Cofradía. Both were part of our youth group a few years ago. Diego plays drums in the worship band. 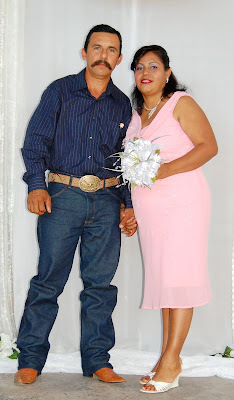 Geña and I had the privilege of being their Ring Padrinos. 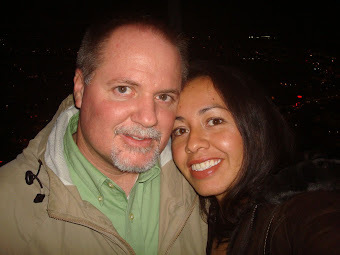 Laurencio and Lucinda Rodríguez from Cofradía. Recipients of a new house built by the Alternative Missions Dwellings ministry. Roberto and Lidia Vázquez from Santa Fé. 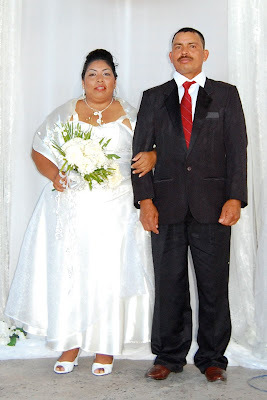 Hugo and Norma Díaz from Cofradía. 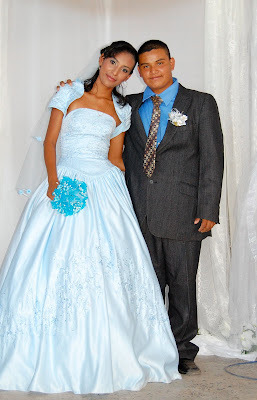 Hugo is Geña's brother. 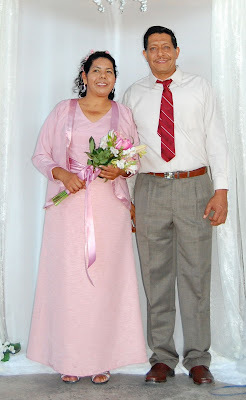 Geña and I had the privilege of being their Ring Padrinos as well. 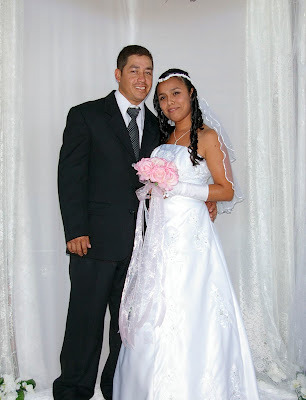 Juan and Angelita Ramos from Cofradía. Juan recently received Christ. 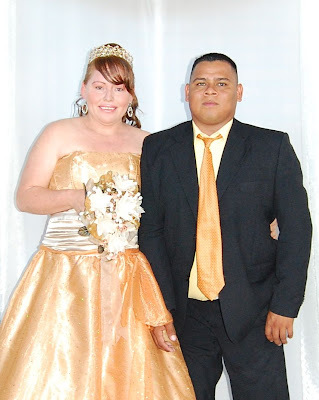 Abraham and Graciela Aguilar from Ruíz. Luis and María Luisa Vázquez from Santa Fé. Luis is our Youth Pastor Intern. Luciano and Victoria García from Cofradía. Alfonso and Secundina Vázquez from Santa Fé. 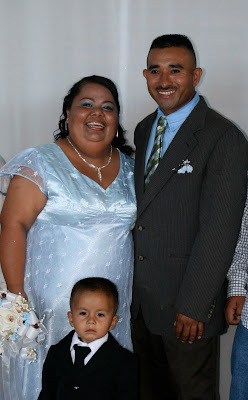 Feliciano and Antonia Orozco from Cofradía. After about two hours of the message and ceremony, everyone sat at their tables as the birria (a type of barbecue style beef stew--very good! ), beans, and macaroni salad was served to about 400 people in attendance. Then the Brides tossed their bouquet's two by two and the Grooms tossed their aprons (another Mexican tradition--in place of the guarder belt used in the states). The dance floor was opened up to the newlyweds and it is amazing to see all of them participating in what looked like a scene from Cinderella as the women's dresses waved back and forth. 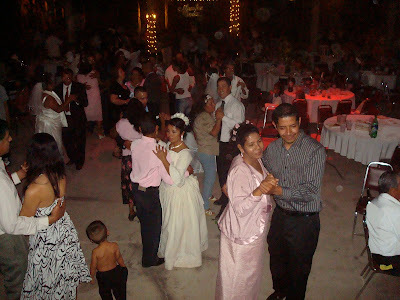 After a while, family members and Padrinos came to dance with the couples. One last group photo was taken...what a night! Thank you to all of you who prayed over this event and over the lives of these newlyweds as well as a big thank you to those who donated finances to help make this dream come alive. 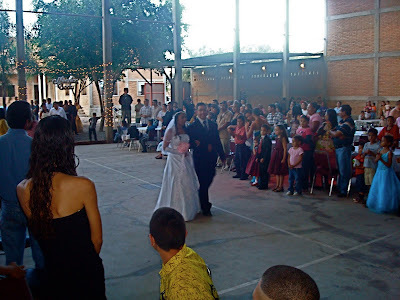 If you are still interested in helping sponsor this event financially as we spent all we had and a little more, you can make online donations typing "Cofradía Wedding" in the note section here. If you would like to use a different way to donate, click here for other avenues. I know it has been a few years since being do there.. but a few of the faces look familar... Praise God for the good things he is doing down there in and for Marriages. Love this idea that you all had. It's great that everyone had such a wonder time. They all looked wonderful. Gena and those who helpped did a wonderful job.